The Nagoya Medal Prize was initially proposed by Professor Hisashi Yamamoto and Professor Ryoji Noyori, and founded in 1995 with Professor Noyori as the president through the financial support of MSD Life Science Foundation (previously: Banyu Life Science Foundation International). The Nagoya Gold Medal Prize has been awarded every year to an organic chemist who has made significant original contributions to the field in its broadest sense. The first medal was presented to Professor Yoshito Kishi, and since then 28 eminent scientists have come to give lectures, including the Goto Memorial Lectureship started earlier. The Silver Medal, established in 1999, has been presented every year to a front-runner based in Japan whose research has had a major impact on the field of synthetic organic chemistry. The medals are designed in the shape of a sword guard, an idea proposed by Professors Yamamoto and Noyori. The flowers on the surface are lilies, which are the city flower of Nagoya City, and have the meaning of "a kind heart and competitiveness". At the award lectures, the award winners are asked to talk not only about the profundity of their unique prize-winning chemistry, but also the in-depth philosophy behind it, encouraging young chemists and students. 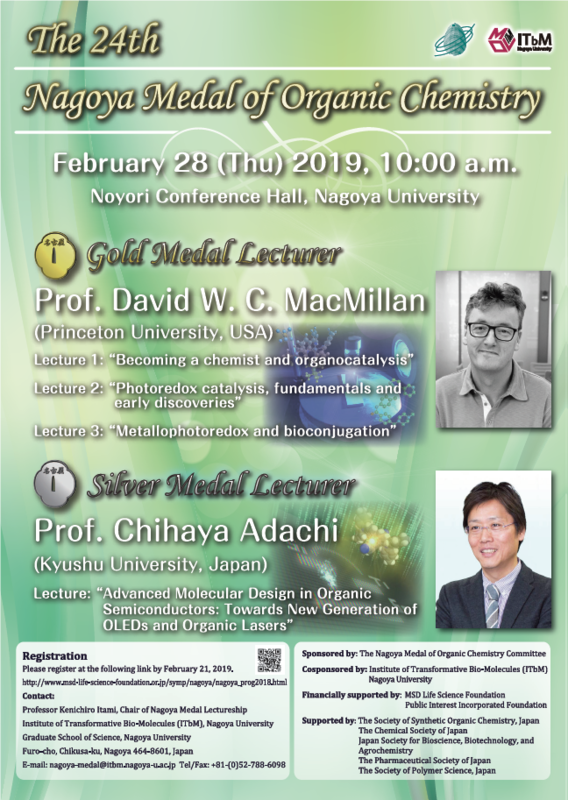 This year, the Gold medal will be presented to Professor David W. C. MacMillan (Princeton University, USA), and the Silver Medal will be presented to Professor Chihaya Adachi (Kyushu University, Japan). Professor MacMillan will be presenting three lectures: 1. "Becoming a chemist and organocatalysis", 2. "Photoredox catalysis, fundamentals and early discoveries", and 3. "Metallophotoredox and bioconjugation", and Professor Adachi will be presenting a lecture titled, "Advanced Molecular Design in Organic Semiconductors: Towards New Generation of OLEDs and Organic Lasers". The Gold Medal is awarded every year to an organic chemist who has made significant original contributions to the field in its broadest sense. The Silver Medal is presented to a front runner based in Japan, whose research has had a major impact on the field of synthetic organic chemistry. MSD Life Science Foundation Website "Program for the Nagoya Medal"
MSD Life Science Foundation Website "List of Gold Medal winners"
Banyu Life Science Foundation International Website "List of Silver Medal winners"